Charities can turn all the number crunching that goes with preparing accounts for the past year into an inspiring strategy for the year ahead. And why wouldn't you? Your supporters and beneficiaries will thank you. Many charities will already have done this but if yours hasn’t, grab this chance and use our recently refreshed financial guidance to help you. 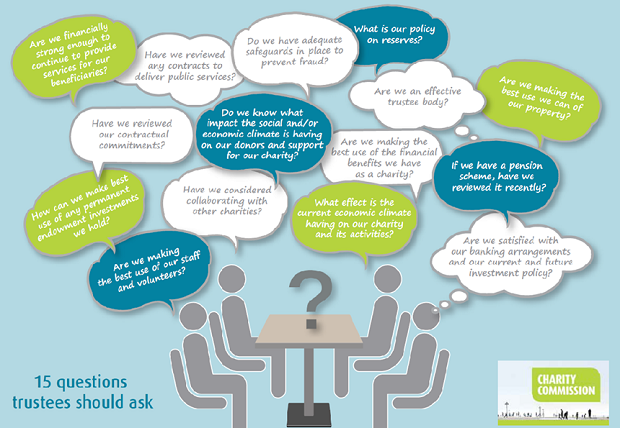 If you’re having trouble getting started, I’d suggest Charity governance, finance and resilience: 15 questions trustees should ask. We’ve designed it to help trustees examine all the critical areas to your charity’s success for example, are you succeeding in your charity’s aims, is your funding secure, have you got good systems in place and have you got enough funds to sustain the charity? Talking of which, we also refreshed our guidance on reserves, the funds that a charity can build up to help it meet unexpected challenges or calls on its services. Does your charity need to do this? It’s not every charity that does, but many do. Whichever camp your charity falls into, you need to have made a considered decision that this is right for the charity and recorded it in your policies. It can be short and snappy or it may need to be a longer piece if that’s best for your charity. Use our practical guide to get the right policy, and look out for what your accounts tell you about reserves levels and whether these fit with your policy. Finally, if you’re worried about your charity’s financial position, it’s obviously best to act before things get really serious. Managing a charity’s finances can help you spot the warning signs that the accounts and forecasts may reveal, if only you know what to look for. If you’re not completely content as a trustee that you and your co-trustees have the controls, systems and skills in place to give you the information and assurance that your charity’s finances are performing as you want, use the new financial year to make a resolution to read this guidance and make an action plan. You owe it to yourself and the charity. As we reach the end of the financial year, it’s an ideal time to reassess what you are doing. So happy new financial year let’s make it a good one. Most people and most charities don't have a 6 April beginning to the financial year, just because this was when the shift from Julian to Gregorian calendar happened in the 18th century. Hi, thanks for the comment. What good public benefit reporting should look like is an important debate. Our report focuses on a baseline level of reporting that includes the required statement indicating that trustees have read it and considered it and a charity saying who its beneficiaries are. What remains disappointing is less than half of charities do this well. It is a shame that when public benefit is at the heart of what charities do that still too many don't celebrate it. A good annual report is part of good financial management, but the latest Charity Commission Review of 'Public Benefit Reporting by Charities' seems to give equal weight to whether a charity has a particular form of words about 'having regard to the Commission's guidance on public benefit' as to actual reporting about public benefit. This makes the Commission look ridiculous and detracts from an otherwise interesting report. The obligation is to HAVE regard, not to SAY that a Charity has regard. Reply to your reply which was attached to the wrong comment. Of course charities should say what they are doing for 'public benefit'. But you don't answer my point. Why does the Charity Commission focus on the form of words? If a charity is reporting on what it is doing, and showing that that is for public benefit, that is what matters. To fuss about whether it mentions the Charity Commission is self-important pedantry. Need to keep all this point in mind during new financial year. It will help to maintain balance sheet and to get better growth.